Victaulic, the world’s leading manufacturer of mechanical pipe-joining systems, today introduced the Mechanical-T Spigot Outlet Style 926 for high-density polyethylene (HDPE) pipe. This new addition to the Victaulic Refuse-to-Fuse™ HDPE system is the company’s first mechanical outlet available for HDPE, steel and ductile iron pipe, allowing system engineers to connect branch lines to existing or newly installed pipes quickly and seamlessly. Conventional installation methods of outlets to HDPE pipe require operators to completely drain and dry existing pipelines in order to electro-fuse connections. The process also requires expensive equipment rentals, additional power costs and presents a host of challenges when installations are done in inclement weather. These time-consuming installation challenges lead to costly downtime and lost production. The simplistic design of the Style 926 eliminates the need for fusing and can be installed in minutes and in any weather condition using hand-held, battery-powered simple tools and/or hand tools. The Style 926 is also weather independent and can be installed rain or shine without protective tents or covers, and joint completion time does not depend on atmospheric conditions. Designed for buried or above ground applications, the Style 926’s steel hardware is zinc-plated for corrosion-resistance and its ductile iron construction with optional rubber lining makes it ideal for abrasive mining and oil applications such as wastewater, fly ash, slurry systems, mild acids/chemicals, oil lines and drainage systems. 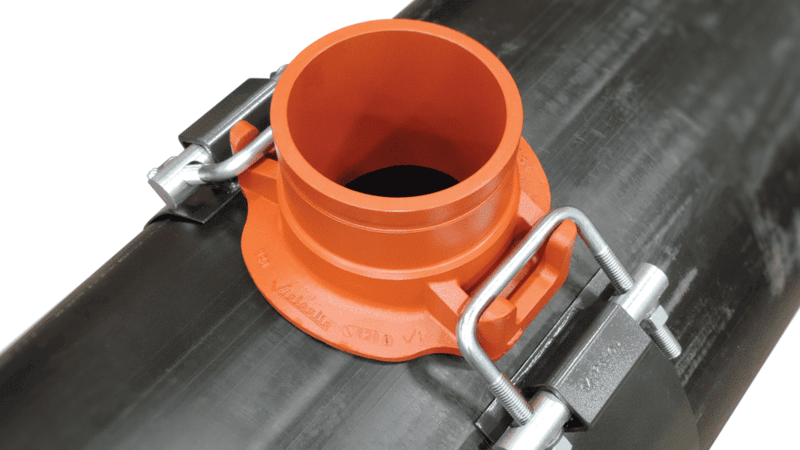 The unique locating collar provides rotational resistance and prevents misalignment of the outlet connection allowing for accurate installation and a leak-free joint. With minimal parts, low profile and simple assembly tools, the Style 926 is an optimal choice for field fabrication. Spigot outlet is also suitable for use on steel pipe and AWWA sized ductile iron pipe. The grooved outlets provide a direct connection to grooved steel pipe, valves, fittings or other equipment with grooved mechanical couplings. Grooved transition couplings are available from Victaulic for connections to plain-end HDPE and grooved American Water Works Association (AWWA) size ductile iron pipe/valves/fittings/equipment. For more information about the Style 926 Spigot and the rest of Victaulic’s system solution for HDPE pipe, click here. How can Victaulic Products Help HDPE Pipe Beat the Heat?